Bible Cartoons: Matthew 16 - Peter’s confession - Scene 01 - Who is the Son? 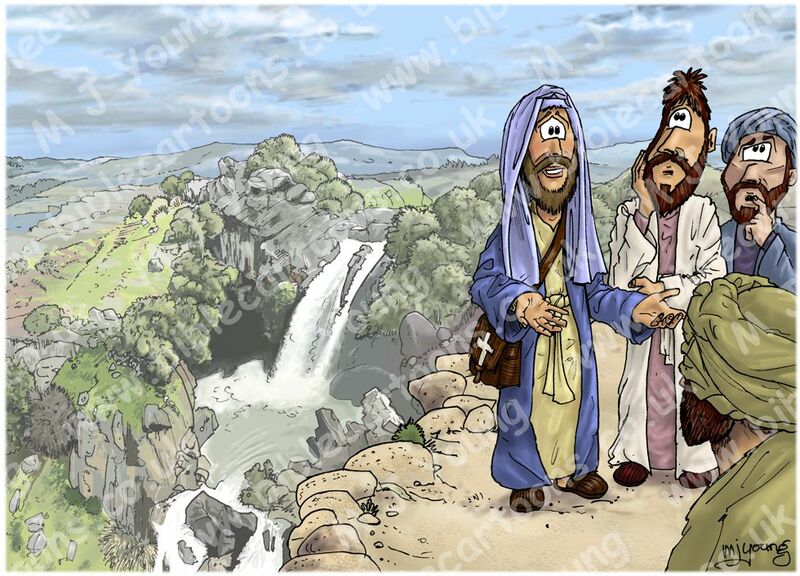 Bible Cartoon: Matthew 16 - Peter’s confession - Scene 01 - Who is the Son? 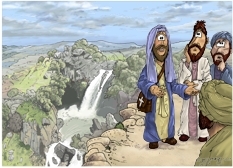 From left to right: Jesus, in blue outer robe, talking to Simon, Andrew. Batholomew/Nathaniel in the foreground (looking at Jesus). This scene is set above Caesarea Philippi, which was apparently the furthest north Jesus went in his earthly ministry. I have drawn Jesus with a head scarf & bag over his shoulder, which shows that he & his disciples have journeyed during the day. I have never drawn a head scarf or bag on the Jesus figure before. Notice the pale cross shape on his bag. In the middle background can be seen some waterfalls, which come from a spring near Caesarea Philippi. The water has eroded the local limestone into deep valleys & ravines in places. Here’s the scene without the figures. I have removed the fading/ghosting layer, so you can see the scene at full colour strength. Caesarea Philippi *1 (Ancient Greek Καισαρεία Φιλίππεια) or Caesarea Paneas (Καισαρεία Πανειάς) was an ancient Roman city located at the southwestern base of Mount Hermon, about 25 miles (40.2 Km) north of the Sea of Galilee. The city is mentioned in the gospels of Matthew 16:13 & Mark 8:27, but is now an uninhabited ruin, an archaeological site in the Golan Heights. The surrounding region was known as the “Panion”. Paneas (aka Banias) is a spring near the old city ruins, which also lies close to the fabled “way of the sea” (aka Via maris) mentioned by Isaiah,*2. This “way” is an ancient road or trade route. In the distant past a great spring gushed water from a cave in the limestone bedrock, which fed into the Huela marshes, which in turn fed the Sea of Galilee & The Jordan River. This spring is currently the source of the stream Nahal Senir. 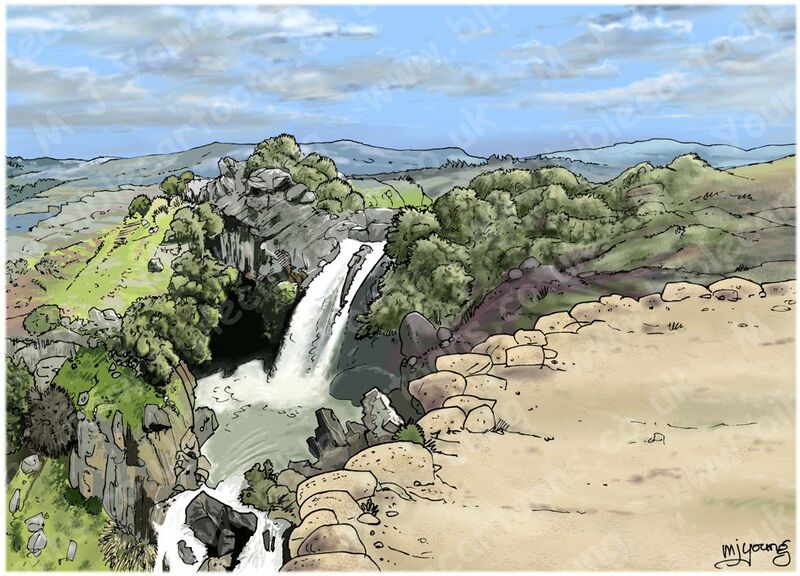 In the past the water flowed in a torrent, but now it only seeps from the bedrock below it. The abundant water supply made the region very fertile & therefore attracted settlers.